Mt Kilimanjaro comprises 3 volcanic craters, 2 extinct and 1 dormant, to form this free standing mountain and is reputed to be the highest free standing mountain in the world. Such claim requires some understanding as to how mountains are measured, and for the pride of certain nations, there are various creative ways of describing their height. If mountain is measured from the sea level, which is the de-facto method. But what is the definition of sea level. Or do we measure from the base to the summit? And there is another way to measure which is to measure from space, meaning that which mountain is nearer to a stellar object, like the moon. Hawaii Mauna Kea if measured from the sea floor to the summit will be 10,058 m.
Mt Chimborazo of Ecuador at 6,268 m but because it sits on the bulge of the earth, it is actually 2.4 km nearer to the moon than Mt Everest. Though we reside on the blue planet, the earth is not a sphere, but a flatten sphere budging at the equator. And then we have the definition of "free standing mountain" vs the Himalayan mountains that tower above 8,000 m! To understand, free standing mountains are usually formed by volcanic action, where the magma from the crust pushing out the outer layer of the earth, and slowly rose to form an individual mountain. The Himalaya is formed by the tectonic force between the Indian and Eurasian plates, which gives rise to folds and undulation on the earth surface, as the plates are long. these majestic creases form mountain ranges. Uhuru Peak is at the Kibo Crater on Mt Kilimanjaro, and the official signage proclaims that it is at a height of 5,895 m AMSL or Above Mean Sea Level. The definition of MSL - will be the "in between" point of the lowest and highest tides, and this will occur during the spring tide, when the moon is new or full. Regardless, for us that climb, we marvel at the beauty and behold its majesty, and more so on God that creates them! Uhuru Peak on the Kibo Crater of Mt Kilimanjaro is claimed to be the highest mountain in continental Africa. Measuring at 5,895 m amsl (above mean sea level), it also boasts the title of being the highest free standing mountain in the world! From 4,000 m onward, the terrain is deemed as high desert. And in the foreground, it resembles a lunar landscape! Marangu Route - and sometimes also refers to the "CocaCola" route. Easiest among the 3, with lodging in huts. Four years ago, my first attempt to climb Mt Kilimanjaro was aborted due to AMS (acute mountain sickness), and since then I have grown wiser in trekking mountains. But during an actual climb, when you walk, and you cannot talk, you better stop! There is certain logic to these, and simply put, at sea level, our resting heart beat per minute (bpm) should be less than 60, and in an intensive workout, it can easily climb to 180. This range provides plenty of cardiovascular workout, and usually it is ideal to train at the aerobic range. However, at higher altitude, our resting heartbeat can rise to above 60, in the region of 80, with our exerted heartbeat rarely reaching 150. This is a much smaller range than at sea level for the body to cope with the lack of oxygen and the physical exertion. All these preparation, indeed help to strengthen not only us physically but also our mental resolve to reach Uhuru Peak at 5,895m, as many times that we have witnessed, even at lower mountains, the mind gives up long before the physical body yielded to tiredness. We are very aware of the AMS, and how once it hit any individual, the climb will be over, and we prepared our trip in such a way that we will climb high, and sleep lower, and not only with this strategy, we will “pole pole” ourselves to the summit. (Pole Pole – Swahili for Slow). 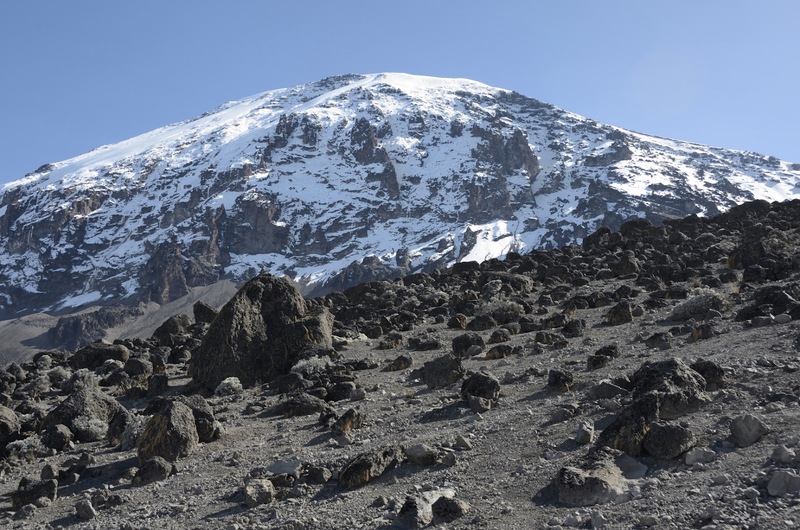 Our adaptable body will take about a week to generate the much needed haemoglobin (red blood cell - oxygen carrier), and for Kilimanjaro trekking, a week is usually too long! Therefore, the alternative will be to go "pole pole". Climbing for the second time, it certainly gave us certain advantage in terms of pacing ourselves, and at the same time to have good picture coverage of our exploit. 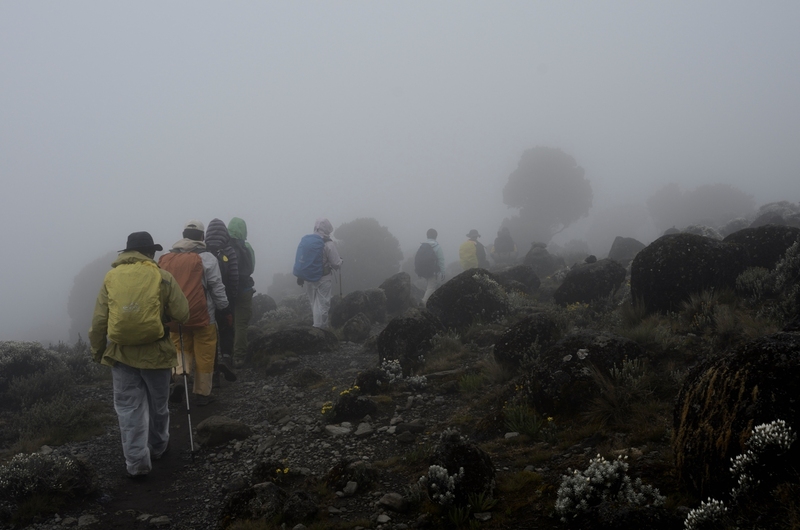 Similar to previous climb, we have chosen the same Machame Route, tough with many ascent and descent, it also the best scenic route. Having arrived the day earlier, and still recovering from jet lag, we proceeded with day 1 of our climb, which was a challenging uphill climb. 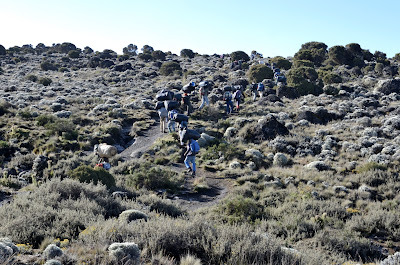 Though the distance and altitude coverage are deemed as doable, however our bodies were still not condition, and to make things more difficult, we were carrying excessive loads. I estimated my load to be about 11 to 12 kg, inclusive of the camera gears, water and food. Reaching Machame Camp was a great relief for our aching muscles, and we decided to offload unnecessary gears for the subsequent days of climb. Blue Monkey - finally we get to see these monkeys - unfortunately too condition to the human environment. 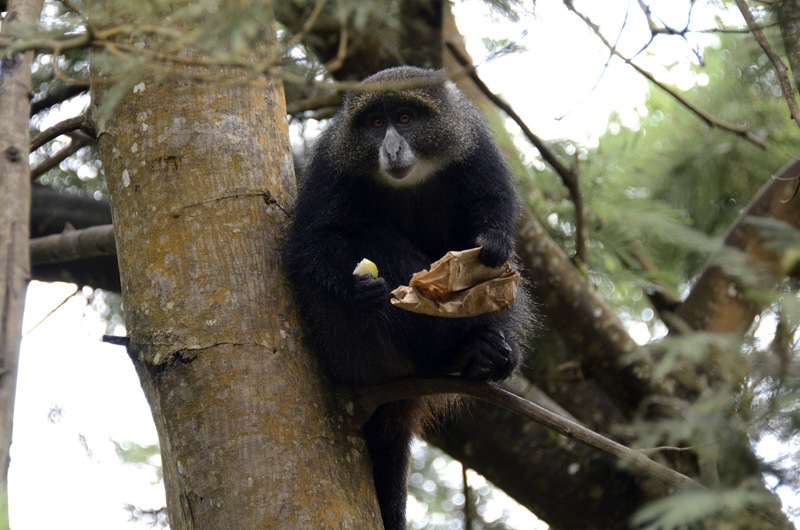 Scavenging for food in the form of human's trash! ...... it will turn narrower and muddier! With muscles conditioned for carrying load, and the body slowly getting adjusted to the limited oxygen, we found today walk to be more enjoyable, with plenty of opportunities for photo taking. Shira Camp sits on a plateau, a collapsed extinct volcano, and we were able to have a good night of rest on flat ground. 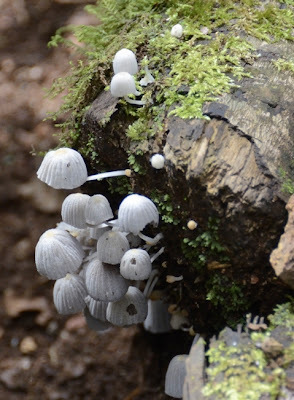 Because the raining has just passed, we noticed a lot of mushrooms sprouting on dead logs. This should belong to the Agaricus family. Starting the trek, and at 3,000 m the vegetation is that of a rain forest. Today will prove our body adaptation to the high altitude, as Lava Tower is located at about 4,600 m, and if we are still susceptible to AMS, this will be the “telling point”. 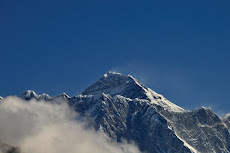 Indeed, the thin air caused some of our fellow climbers to start to have headache, and some even vomited. Sensing the same symptoms that hit me previously, we prayed that our bodies will be able to acclimatize fast. 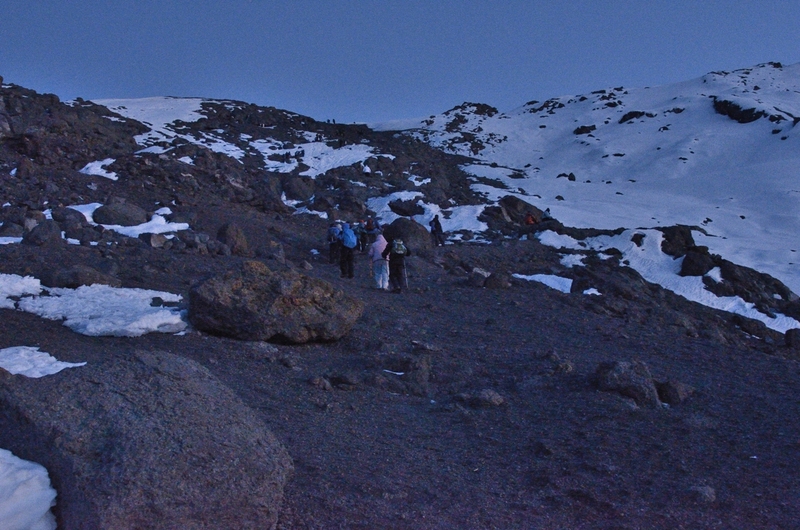 Thankfully, we slept low, as Barranco Camp site is situated at about 3,900, a good 700 m below Lava Tower. This will give our body that chance to adjust, and hopefully to reach the summit. Overlooking Shira Campsite, is the Kibo Crater. Lobelia deckenii - the blue flowers are hidden under the foliage. Orange Lichen grows in abundance. At this level, ice already starts to form. Walking to the Barranco Camp, we have to walk to this forest of Senecio kilimanjarii. Such plants thrive in this elevation. 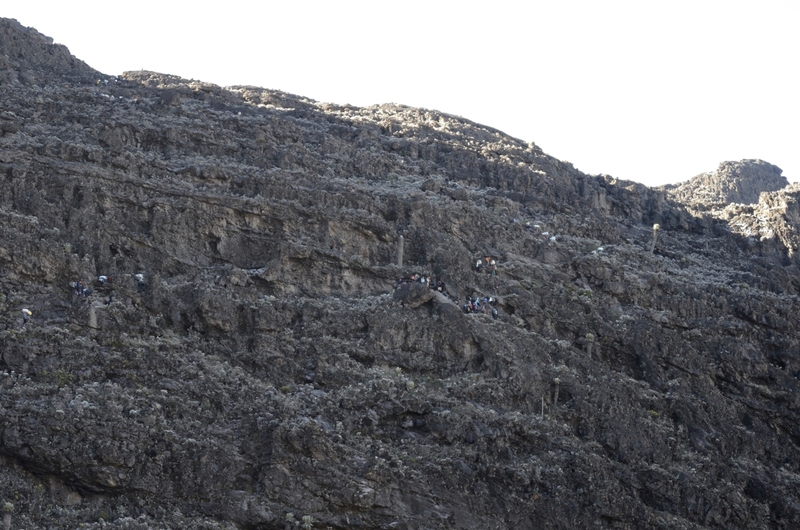 This will be deemed as the most fun part of the climb, as we have to climb a cliff with zig-zag pattern on the rock face. In rock climbing grading, I would consider this as 4C, pleasantly doable and fun. Definitely, hands and legs will be required for such a climb. The Barranco Wall is about 200 m in height, and once we passed this point, it will be gentle terrain to Karanga Valley. A lesson we have learnt, on our first trip, we skipped Karanga Valley and headed for Barafu Camp. This was a grave mistake, as the time taken will be long, and secondly we will not have opportunity to acclimatize. Breaking this part of the journey to 2, both spared our bodies from fatigue and definitely provided one extra day for acclimatization. Barranco Wall - or sometimes it is called the Breakfast Wall. It is a steep climb, but manageable as there are enough zig-zag routes on the wall. In fact, certain points require a fair bit of 2X2 (hands and feet). But to the experience porters, their legs and good sense of balance will suffice! 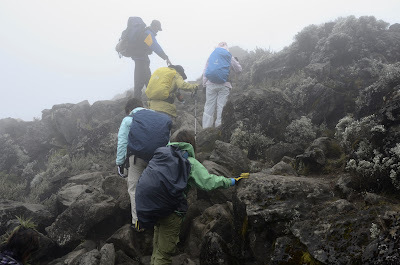 Upon reaching the 200m Barranco Wall, we are rewarded with a beautiful summit view. Again, this will be a gentle climb between both camp sites. In fact, the elevation gain is not considered much, and thus we decided to opt for another 200 m ascent once we reach Barrafu Camp. Again the principle of climbing high, and sleeping low was on our mind. This will be our last camp site before the summit ascent, and this will take place this evening at 11:30 pm, and it will be a long day. Feather scavengers abound throughout the trekking range of Kilimanjaro. This adaptive raven knows where to get free and easy meals. 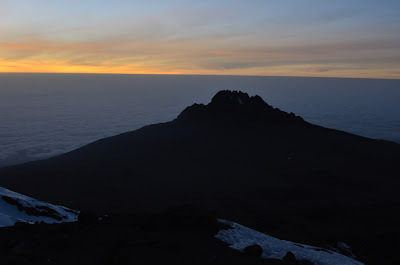 Day 6 – Barafu Camp to Stella Point (5,739 m) to Uhuru Summit (5,895 m), and back to Barrafu Camp, and down to Mweka Camp (3,100 m). According to itinerary, we will start our climb at midnight, and hope to reach the summit between 6 to 8 am, and then a 4 hours descent to Barafu Camp for lunch, upon which will be another 4 hours of trekking to Mweka Camp. Climbing at night has its plus point, in that you cannot see far and be discouraged to realize the distance to cover, but simply focus on the next step. 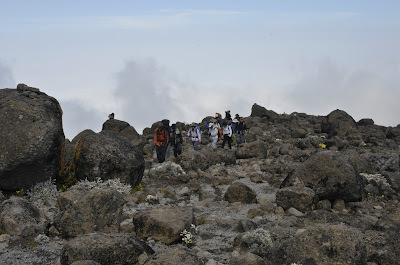 We would have walked 7 hours before finally reaching Stella Point, by then we have already ascended 1,100 m, and another 150 m to climb between Stella Point to Uhuru Peak. Along the way, water in our plastic container froze, as well as water in our camel back and tubings. Thankfully, we came prepared with thermos flask which offer us warm water to take away those chill. Though the height difference between Stella Point and Uhuru Peak is 200 m, and only 800 m apart, which gives an average gradient of 14 degree. This will prove to be one of the hardest distance to cover, for it took us close to an hour at that altitude to cover that distance and height, and once we saw the summit, it is not difficult to understand why tears flow from some of our eyes. 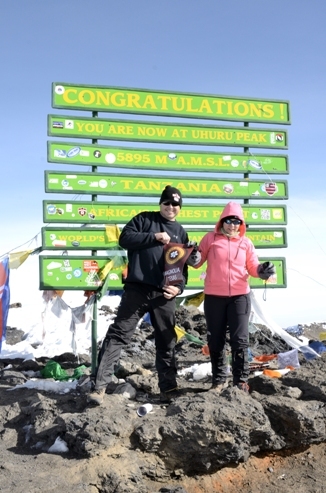 Finally, after 4 years, and many months of training, we have reached the roof of Africa! An exhilarating experience which surpassed any mortal’s understanding, we felt elated and joyous to have come so far. But still we are humble by the thoughts of our guides and porters who carried even heavier load, making the climb with us without even breaking into any sweat or panting for air. At Stellar Point - almost there! Finally, Uhuru Peak is sighted. Spirit lifted, and tiredness gone, our only aim was to touch the board. 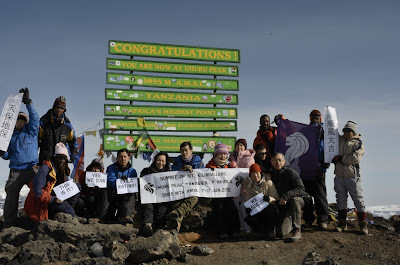 Uhuru Peak - finally we have reached the summit. Up on the summit, came a couple from the Lone Star State, pictures I took for them, hoping to share with them, please drop me a line or two, in the comment field, and the higher resolution will further wow you! This will be the anti-climax, but still full of energy. It must have been the sudden oxygen loading that our bodies are experiencing. 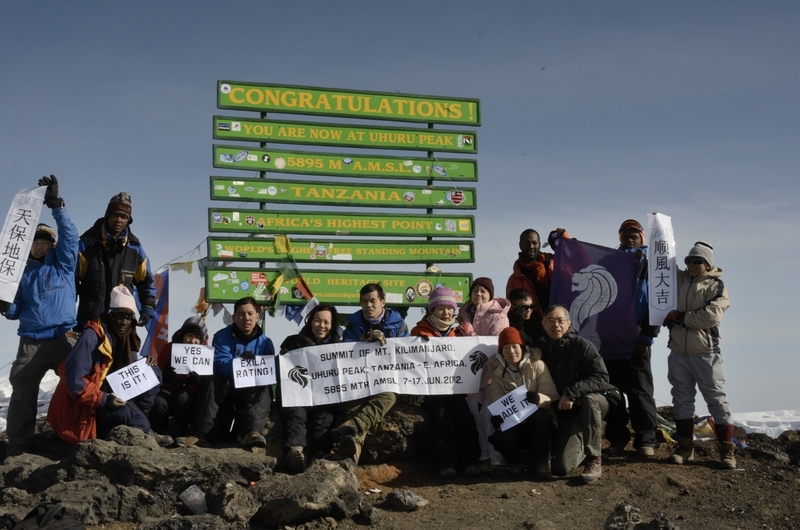 And in the tradition of every Kilimanjaro climb, our friends sang for us the Kili song. 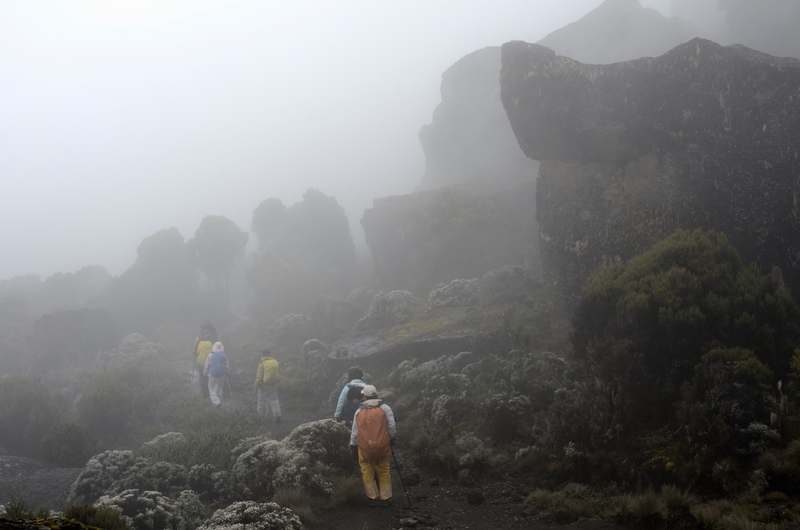 It is nice and valuable information about Mount Kilimanjaro Tour. I appreciate this blog.